Sometimes when listening to music, sound burrows deep. Like an underground flow of water only heard through modern instrumentation. The knowledge to detect this flow without electronics has been almost lost entirely. The cassette titled Creator, You Destroy Me reaches through time and uses this forgotten wisdom to relay the underground current of music that exists within each of us. How this is achieved is still mysterious and unknowable by the listener. 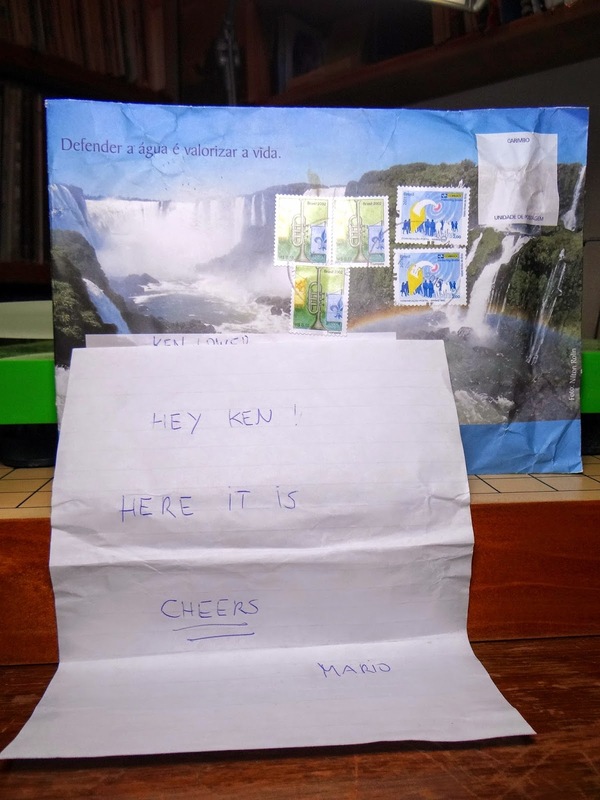 Be My Friend in Exile is Miguel Gomes. This is his roughly forty five minute sojourn into a world existing off all radar. Sounds here seem to echo in vast chambers. Electric guitar cracks, shedding brief moments of illumination then fades away returning to drone beneath the earth. Voices can be heard resembling the sparingly dripping stalactites protruding from the cavernous heights. This path was carved away by dense molecules, now hollow chambers for sound to travel. A listening journey through an opaque world of drone. As ears adjust and comparisons are made realization that this is some underworld is thrown asunder. An odyssey through the mind of Miguel is really what we have latched onto. These are currents of emotion. Voids of feelings. Echoes and reverberations of synopses repeating habitually. Then emergence of firing neurons on the event horizon. The sound is dense and time span is substantial. Within longer pieces, eddies of notes swirl and fill your ears, then dissolve back into the wash. In what shape was Miguel's consciousness when these tracks were created? How far off the path did his soul travel to collect these notes? For any listener, Creator, You Destroy Me can be both somber or hopeful. What are they for Be My Friend in Exile? This is out now on the continually impressive label Already Dead Tapes. Pushing close to 170 releases since 2009! There are fifty of these cassettes and they are available at the label and a few left from Be My Friend in Exile's bandcamp page. Many releases from Already Dead Tapes are sold out and i am sure this one will follow that path. Music with intense feeling must be listened to at the proper time. Creator, You Destroy Me deserves the chance to be heard in the correct venue. Blurred music from the minds of Jacob Koestler and Josh Russo. I have been listening to the cassette on repeat for the entire weekend. There was one point i felt a grip for description was in hand, but has eluded me once again. Six tracks over a period of twenty minutes take you to all sides of this hexagonal journey. In order to call forth words, Image of an Other must be examined by listening to the tracks creating it. Pressing play brings "White Winter" to your ears. Drone mixed with a futuristic mechanical siren, Ulysses has yet to hear. Complex in the sense of being both alluring and frightful simultaneously. The entire pallet shifts with "Shadow of Our Plane". This track throws my ears back to eighties music. Dark vocals with rhythm delivering late night adventure into a changing musical world. The third track "Heart of Stone" stops the listening continuum. Disjointed noises made by a new world of instruments. An automated voice repeating the words Heart of Stone over a background of static and feedback. One can only imagine what this music would connect with. "(man) ∞ (pig)" does little in helping reveal what is being created. My best observation would be something organic as well as robotic. The industrial tone is heavy and allows for little rest. At this point as a listener, i have transgressed deep into the world of Rural Carrier. Their offering now is "Green Winter", a drone based piece that harkens slightly into the futuristic adventure the first track "White Winter" had started. Lastly "Grow Twice", is synthesizer in harmony with an almost human less voice, both funneled together causing your brain to overflow. Vocal alms provided for battered ears. The mysterious journey ends with discovery and without understanding. This is the way Rural Carrier intended it to be. Jacob Koestler and Josh Russo are on the edge of sound with this project. There are industrial moments, but nothing like what was created before. This sound is new and is extremely innovative. Image of an Other is out on the label My Idea of Fun. With almost 300 releases, this label has been hard at work. Not sure on how many there are but available now in both physical and digital mediums. I would very much like to see Rural Carrier live. I am sure the show would stand out. This is a composition you can really get lost in. 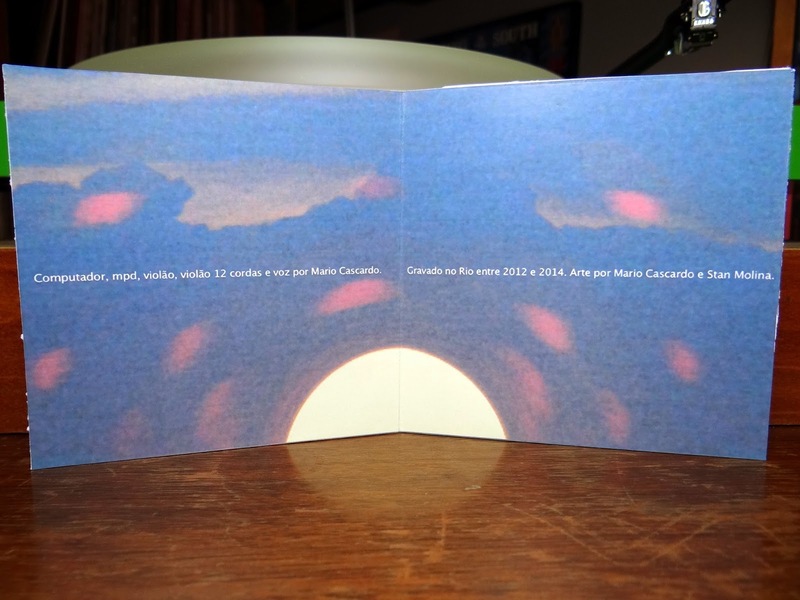 Abertura Do Programa by Mario Maria is about twenty five minutes of ambient collage. There is an underground flow of allurement that passes through the ten tracks on this compact disc. Vocals are mixed with vintage samples from a bustling world. Nylon stings of a classical guitar are heard and take you to the southern hemisphere. As the listener drifts through this album, the journey takes root in a seldom heard macrocosm of the composers consciousness. Antipodally originating from the microcosm of the stations on earth we all reside. This collection of tracks makes me imagine late nights in the summer. Walking city streets and hearing the inner most sounds of the neighborhood. With the next block the sound changes, something else is happening. There is a consistency between blocks as if these residence are from long lineages of cultural heritage. Sounds are sentimental, textural, jumbled with each other. Clarity is heard then disappears. From a sea of open windows this cacophony spills out and gently drifts down to my ears at ground level. At times my mind can make sense of it, bringing agreement. New sounds plummet to the pedestrian level, antagonize the ears briefly, then accord is achieved again. Mario is from Rio de Janeiro and his album is out on Cloud Chapel Records. 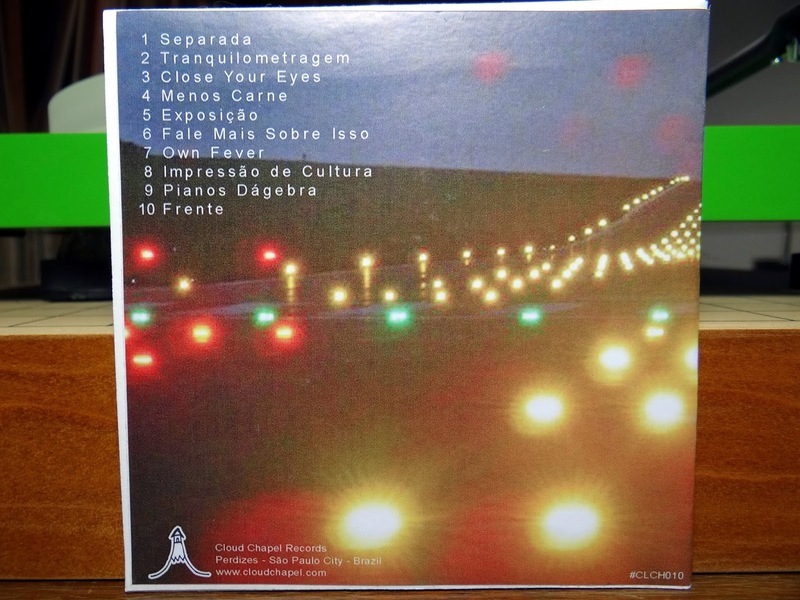 This is my first chance to listen to a Cloud Chapel Records release. I really enjoyed Abertura Do Programa and feel good about making a connection in Brazil. I would suggest taking a listen to more releases on the Cloud Chapel Records bandcamp page. There are some cool artists on the label and vary enough to fall into the laps of many different tastes. This Mario Maria release is a good place to start! 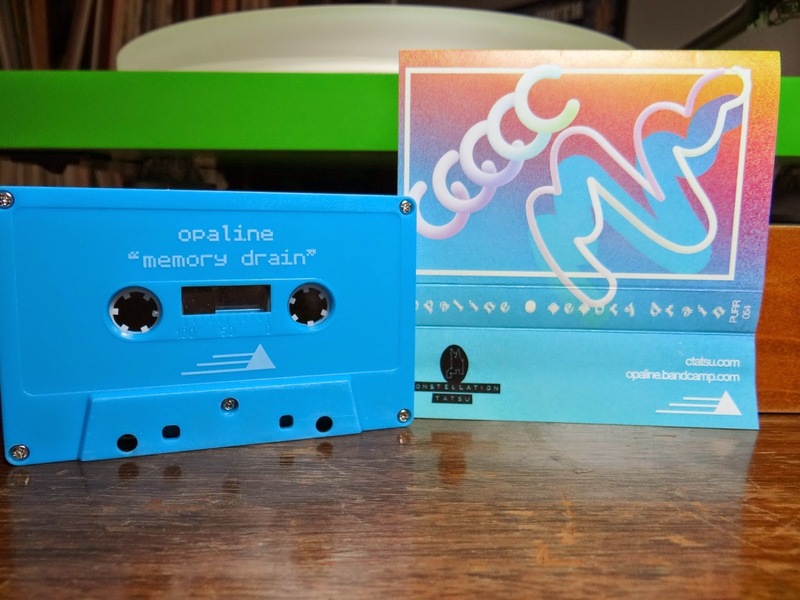 Memory Drain by Opaline is one of the their most recent cassettes arriving in a flurry of 2014-2015 releases. I went back and jotted down the discography from last year to present. The amazing fact is everything is sold out from the respective label except for the most recent release on Psychic Troubles. 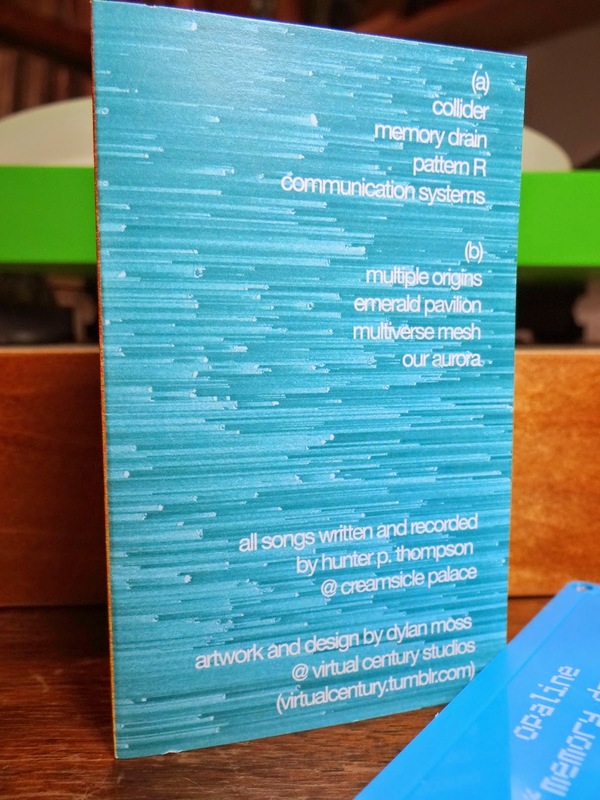 The Constellation Tatsu release titled Memory Drain is what i have in the cassette player right now. This release maintains the quickened pace of synthesizer in overdrive. There feels like an added layer of sonic depth creating the ability to hear further into the microscopic world of data transmission. From the opening track titled Collider, this half hour plus of music provides little rest with it's electronic barrage. The sounds are beautiful and at times could be considered tranquil, but have a pulse that beats a little quicker. This is consistent with the last three releases by Opaline, i think they are less subdued than the earlier offerings. As Opaline transmutes into a more complex array of compositions, there always maintains a connection with the ground, providing stunning and positive musical forays into the electronic unknown. As you probably have surmised from the beginning of this write up, this release is sold out at the Constellation Tatsu site. Currently there are copies available from Tomentosa and a couple on Discogs. I have not been diligent enough to purchase very many Opaline cassettes. This one was received with the seasonal batch deals from Constellation Tatsu. Their consistent quarterly bundles are really one of the best deals in credible sounds at sincerely friendly prices. Opaline's Memory Drain is a concrete example. The gravity of sound is heavy with the new release from DAYIN titled letting go of people. The x-ray flux peaks sharply like a black hole with retrograde rotation. Time slows as we draw closer to the center. DAYIN keeps the listener transfixed with drone under pressure. The heaviness upon the ears causes the outside world to blur and cease to be realized. As the thirty plus minutes transpire, seven tracks command your complete audio presence. Back in another write up i mentioned three labels i would use for ambient/drone music, dark, neutral and bright. For this release, letting go of people, i would not necessarily throw it into the dark category. It is more like neutral with moments of both dark and bright. The sounds are massive, and tend to pin the ears down, but this is not accomplished by being harrowing. This takes place with density, a impenetrable wall of sound pushing you along. Because the tape has different tracks and the solidity of music changes, there are ample moments to regain your balance. With this positioning, the listener is able to comfortably be enveloped by the world of DAYIN. As the tape repeats, stasis is gained even more and letting go of people becomes increasingly relaxing. One of three releases in batch number nine for Cosmic Winnetou. You can order this release straight from the label, there were eighty produced. Tomentosa just sent out an email with their latest update. All three Cosmic Winnetou releases are on Josh's site ready for purchase as well. With regard to conversations with Günter from Cosmic Winnetou, i have learned the next batch is going to be a little different. You will want to keep an ear/eye out for when he releases the news of what is flowing through the conduit. Should be really nice like everything has been so far. Have you ever read the Edgar Alan Poe story titled A Decent Into Maelstrom? As BYE begins, the wash of noise overwhelms the listener. This is similar to the old man in Poe's story describing his tale, he asks the listener: "and if you will creep round this crag, so as to get in its lee, and deaden the roar of the water, I will tell you a story that will convince you I ought to know something of the Moskoe-strom." As BYE reveals itself to the listener, i can not help but think of how the music fits with the grandeur of the whir pool and the survivor relaying his descent and escape to the listener. Both start with chaos and mystery only to subside and convey depth that will only be guessed upon. Patrick Piper is about a half hour story in sound. The world within these spools is immensely telling of skilled craftsmen and their visions. What starts as an eruption of electric noise gives way to beautiful notes refracting sound and creating the warm glow similar to a setting sun. There is tranquility here, created by patience and knowledge. Drone with a touch of dry vermouth. Relaxed but slightly bothered by an alien world trying to get in. Initiating as a harrowing experience the sound unfolds with charm and a repartee, asking to be listened to again. With the next play, we can hear closer and let go even more. This is #29 for the label A Giant Fern. The last couple of batches from A Giant Fern have really been outstanding. Each release stands on it's own. This makes A Giant Fern kind of difficult to pin down as a label with a specific notch. Everything being released is just different enough to keep a surprise factor alive for new releases. The guarantee of releases being good is slowly being earned. Patrick Piper created something very special here. I think this cassette will race and disappear before the last one i posted from AGF will. For the last year Demonstration Synthesis has been flying low to the earth and connecting with cassette label stations across the planet. The latest ping on the radar was in Germany at the Cosmic Winnetou base of operations. Information received and the cassette titled DS20 has been created. The 20 in the title is in accordance with how many Demonstration Synthesis tapes have been released in a little over a year. Daniel James Leznoff is the Montreal based helms person guiding this prolific project of incredible proportions. He has been and is a student, teacher, artist, composer and flickering mortal being. The Demonstration Synthesis project allows us to hear sonic output from Daniel's mind. As the light renews itself each day, i am sure this abounding project will transmute into different sparkeling brillance. At this moment DS20 captures listeners attention with nine tracks over thirty five minutes. The instrumentation is simple, keyboard synthesizer. The music extends from elementary to complex. There are moments making me think of how the background music would sound to revived beatnik poetry in the twenty second century. Other tunes make me visualize a futuristic electric organ shop in a space mall, with young children jumping on the bench, displaying their prowess on the test machine. Some tracks would fit well with stop motion photography of budding flowers and trees. For me, the overall sound feels like it has been reverse engineered by some connection Daniel has extending into altered existence. The tone of all the tracks are huddled under one umbrella making everything stick together like German glue, but where Demonstration Synthesis is taking this stroll is completely new. This cassette is part of Cosmic Winnetou's impressive ninth batch. As this is being noted, one of the three in the batch is already sold out at the label. The Demonstration Synthesis tape is still available as well as the dayin cassette. The batch price has been adjusted for a two tape deal. Tomentosa will have these releases in the future. Between both, Cosmic Winnetou and Tomentosa, most of the the cassettes from CW are out of stock. This is a very outstanding accomplishment since many of the releases are run in batches ranging from 75 to 100. Creating music to tap into transcendental world of well being is a signature for Inner Islands. Braeyden Jae's new cassette Turnings follows this path using dense electronic harmonics. I am sure Braeyden knows what Inner Islands' is all about since he was the label founder. His style of composition has similar tone and feel with three other cassettes he has released over the last few years. Turnings is the closest to the light while his Hel Audio, Spring Break Tapes & Patient Sounds releases take paths deeper into the earth. With ten tracks over a half hour, the churning electronic world changes and mutates throughout the listen. There is very nice cohesiveness between pieces. Drifting then suspended, the music lets you go and gently guides you simultaneously. Sometimes the guitar sustains itself in clarity, the sounds become crisp and the moment is simple and beautiful. As the tone become more opaque, the listener finds himself behind the waterfall. The beauty exists but sounds are thick and sink farther into your mind. Inner Islands is releasing cassettes at a reliable pace. They also are selling out these tapes at the same consistent measure. I am not sure how many Braeyden Jae's Turnings cassettes were produced, but am certain there is a finite number. If you like swirling and massive electronic landscapes giving way to open plateaus of far stretching beauty, this cassette is your audio guide. Everyone is so far along. Peter Kris is even more distant. 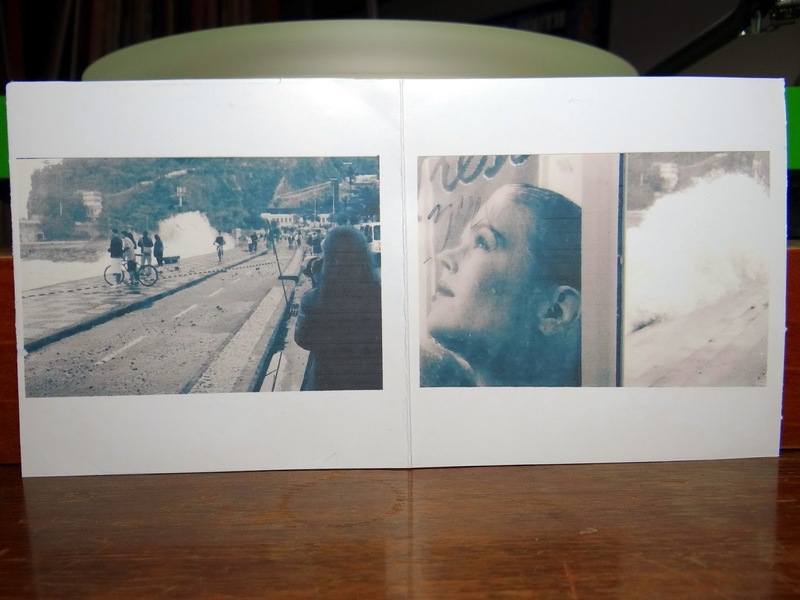 Completely changing the mood, Peter Kris' new cassette Sprawl And Sky is a composition from boundless experience. As part of German Army, you would be half right or wrong expecting a solo tape to be more extreme or more subdued. Sprawl And Sky follows the direction of the later to a good degree. The most outstanding feature of this cassette is the texture Peter Kris evokes. The sounds are interwoven creating a sonic canvas somewhat jagged at times, but overlaid on a foundation of musical beauty. I noted this new listening accessibility in a previous write up for German Army - Social Catalyst on Jozik Records. There is a similarity between these two releases with Sprawl And Sky even more reeled in. As the cassette moves through it's eleven tracks the listener can relish in the patience Peter Kris has gained with creating so much music. There is a sense of delight from the sound waves being generated by my speakers. Playful guitar like dragon flies moving in the heat of the day. Timeless notes reaching back into worldly merriment are tethered and slung forward by the astute composer. There are a few moments extending into the wheelhouse of German Army sounds. Maybe this will help old listeners move forward and new ones explore the past. The label A Giant Fern brings this incredible sounding tape to a select fifty cassette decks. Beyond this the digital will be there for all. This release provides continued confirmation A Giant Fern has roots spreading across the globe. To make this even more ostensible, Joe McKay the label curator for Spring Break Tapes created the artwork for this cassette. Sprawl And Sky already has some great write ups and will be sold out in physical form soon. The Inner Islands label continues to release beautiful sounds in accordance to the ceremonial beat within Channelers, one in the newest batch. They are Cloaked in Stars and Rivers is over a half hour of brilliant ancestral tunes, emanating deep within the pine needle laden floored forest. The simple grandeur of the four tracks are played in deference to the energy and ancientness of the surrounding verdure. The genre of music created by Channelers is unclassifiable for me. I can summarize the feeling the cassette imparts upon the listener; a sense of well being. Each track is unique in it's composition and all of the tracks are cohesive together. There is no testing of your listening patience on They are Cloaked in Stars and Rivers. This is entirely refreshing when stacked with the multitude of harrowing sounds being created today, proving grounds of how far we are willing to traverse into despair. Channelers is on the majestic high plateau, sparkling with exquisiteness, guiding the listener to tranquility. If I heard this tape with out knowing what label it was on, Inner Islands would be in my top choices. This cassette rests in the wheel house for the label. With a medium amount of internet searching effort, I could not find any background information on Channelers. This is fitting because possibly the composers were just the medium for the sounds they captured on this tape. Not sure on how many Inner Islands produced on this run. Many of their releases are sold out, so there is definitely finite numbers. This is a lustrously finespun composition providing listening companionship for your consciousness! This is my second write for the underground Tennessee label Meliphonic Records. Unlike the first, Graceless is a bottomless sound journey into a pressure heavy world of drone. Matt Johnson and Joseph Allred are the components making up Graceless and Mare is the world they lead you through. Mare is a lengthy exposure to somewhat haunting impressions clocking in at over eighty minutes. The beginning is simply played harmonium with an even more straightforward titled track "Harmonium i". The sound here prepares the listener for the journey by setting atmosphere. The descent begins with "Blossom Unfolds In Flame", over fifteen minutes of cliff falling blurred white noise. Slowing at times to hear the new reality before reaching bottom with "The Last Things". This track really depicts in sound the core of a magnetic planet, the source emitting the aurora for the atmosphere above. "Hungry Ghosts" continues the melt down to the point of becoming more defined. There is more clarity here and less hazed drone. This track breaks through the inner depths of sound to a new dimension, smaller and more precise. The second to last track "Pestilence" stands out like a peninsula on the sound graph. Here, music can be heard. Majestic guitar sustained in galactic void. An arrival of tangible existence in a long spool of imprinted magnetic signals. As the sounds on cassette fade away, one last treat competing the odyssey titled "Harmonium ii", sends us back to where the sound commenced. This is release number nine on Meliphonic Records. I am pretty sure the label is run by Joseph Allred, but mystery surrounds him making everything even more alluring. Mare was set upon the cassette world in a batch of fifty. If you have not listened to anything on Meliphonic Records, this is an excellent starting point.